The art is what makes Seven Bad Cats so delightful. The cover shows the cats on a boat, the brown and pink one on the mast, the tan, yellow, and blue ones in the boat, the white one hanging from a tug of war rope, and the black one tangled up at the end of same rope. The child on the cover could be a girl, or is it a boy? Since the rhyming story is told in first person, we never find out for sure. The child’s clothes are sailor clothes. The hair is short. It’s nice that the child could be anyone. “Today I put on/my boots and my coat/ and seven bad cats/jumped into my boat.” The story continues as the cats do bad things, such as eat from the narrator’s traps, take a nap on the boat’s oars, tease crabs, steal his/her gloves, shred sails, get sick in a pail, etc. The washed-out watercolor with black ink mimics the shades and colors of beaches on cloudy days. The typewriter-style font is faded and fun. Now the cats come in handy as they use their 28 paws to save the sailor. Suddenly they are good cats. The sailor gets on top of the belly-up boat and rows homeward. In the last spread, the sailor takes off his/her boots while pictures of six of the cats hang on the wall behind him/her. The boat is no good for sailing anymore, but it makes a great bed. The blue cat gets the most screen time, if you will. The end papers are orderly rows of oars, weights, and seashells, plus the blue and yellow cats. The story is clever, the art is the star, the rhymes are not always perfect, but they are adequate to move the story along. Would the story have been bought without the art? Fortunately for all the cat lovers out there, we will never have to know the answer to that. 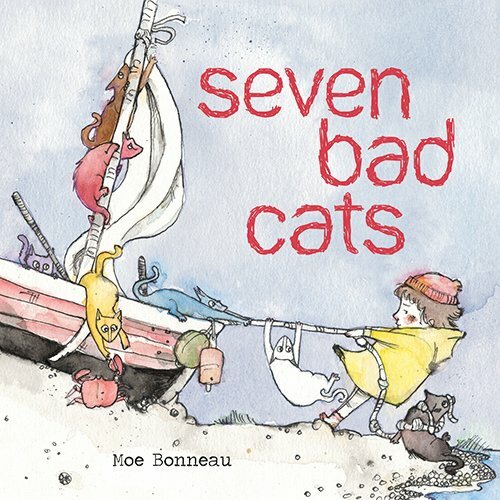 Seven Bad Cats will become a bedtime favorite for its short jaunty story and its charming art. Susan Middleton Elya is the award-winning author of nearly 30 children's books.